Juan Jose Galvan is the editor of Latino Muslims: Our Journeys to Islam. He embraced Islam in the summer of 2001. Juan served as the executive director of the Latino American Dawah Organization (LADO) from 2005-2013. He was the editor of its online newsletter, The Latino Muslim Voice, from 2002-2012. Through his role as editor, he actively contributed articles to the newsletter including: Jesus and the Virgin Mary in Islam and FAQs about Latino Muslims. In his career, he has actively written about various Latino Muslim events, organizations and leaders. Juan manages the LatinoDawah.org and HispanicMuslims.com websites. Juan Galvan advocates for the inclusion of the Latino Muslim voice in the mainstream Muslim narrative. He pushes for increased visibility of America’s Latino Muslims in religious publications. 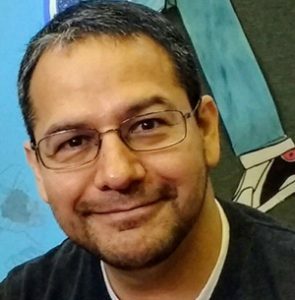 Juan has assisted dozens of students, professors, and reporters with research and has provided access to the Latino Muslim community through interviews and his writings. In 2017, he coauthored a report called Latino Muslims in the United States: Reversion, Politics, and Islamidad. He has been invited to speak at various Islamic conferences. In 2002, Juan Galvan spearheaded the first ever issue dedicated to Latino Muslims in Islamic Horizons, a highly recognized magazine dedicated to the North American Muslim community. He has also coordinated two issues of The Message International magazine focusing on Latino Muslims in 2004 and 2005. Juan is a third-generation Mexican-American and the son of migrant workers. He is the third of eight children and spent his early years hoeing cotton in the rural Texas Panhandle. Juan was the first in his family to pursue a higher education and has a Bachelor of Business Administration in Management Information Systems (BBA-MIS) from The University of Texas at Austin. He lives in the Midwest with his wife and three sons. Juan encourages others to expand their views on the Latino and Muslim identity as he has learned through his own personal experiences.